A good friend of mine was on the board of trustees at a primary school in Rotorua and ended up pulling both his kids from there and sending them somewhere else, WHY! they had a (part) maori teacher that thought teaching there culture all day was education, when my friend spoke to the principle about what was happening who he knew well on a personnel level he said there was nothing he could do!TRUE STORY!!! Crazyhorse, we live in Rotorua and have had this experience with a local child care centre and that resulted in my 4 year old coming home and proudly exclaiming she was a maori! With a change of staff the cultural stuff has vanished to a large extent which i am relieved about as 2 of the previous staff were tuhoe so that explains a lot. She is heading to primary school in 6 months so if you could find out which school it was you can give me the heads up. I have considered homeschooling for the sole reason of avoiding the sort of cultural marxist indoctrination which would result in me and my daughter never seeing eye to eye. With these teachers/educators it is all about deconstructing the past (a marxist technique), cunningly the maori sovereignty movement cottened on to this years ago along with the 3rd wave of feminism of the boomer hippies, and ever since these people marched through our intitutions we have been going downhill very fast. Wow amazing considering this is exactly what The People of Britain done to Maori in the early years. What an idiotic answer. I am baffled at your ignorance. From a wealthy and well educated Maori teacher. The only way to stop this racist claptrap is to have power in the Parliament. Hopefully we will have enough people to emulate Nigel Farrage and the UKIP party in the UK.. A political earthquake that really shows these smug, smarmy appeasers such as Key, Findlayson, Sharples, Parata etc that they have gone to far. Today’s dose of blatant racism. 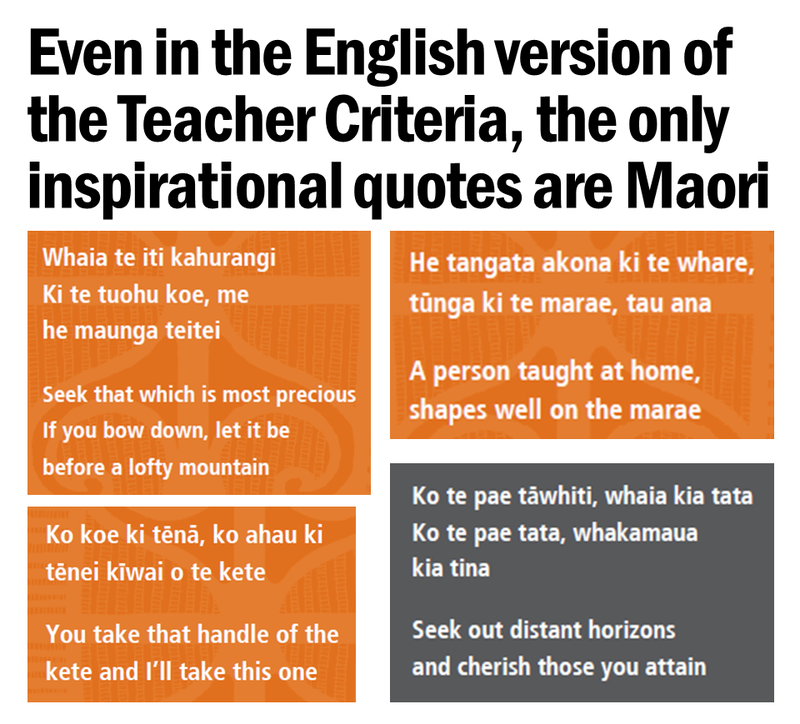 This time, from our half-breed maori mates at the Teachers Council. I’m sure that when Susan Devoy hears about this, she’ll come down hard on ’em. Bet its some university educated i know it all lefty abusing there position just like Sian Elias. It would be good if she was as tough in her job as she was on the squash court, but I’m not as sure as you seem to be. I’m also not sure it’s the Maori on the Teachers Council as much as the sycophantic Europeans who are the major problem. Alas, my tongue was firmly in cheek re. Ms. Devoy, John. If one takes the time to read the subject matter of the above URL, one can see that the maori language is composed of 15 letters. So perhaps the long term objective is to dumb down the whole of the population so no one has any advantages? Its working,a lot of kids are starting university barely able to read and write, what does that say for these so called experts in there field, i can swing poi and poke tongue but can’t fill out a simple form!! You know John, when we first heard you speak on that rigged Maori TV interview, I cringed when you went through a long list of ideologies etc. you were against; viz communists, socialists, lawyers, politicians, bureaucrats etc. (thinking of the image that gave off) . . .
I’ve come to understand why you mentioned that list :0) . . . I still think it gives the wrong impression to state a lengthy list of ‘bad apple’ groups but at least I’ve begun to understand the ‘why’ now. Your posting above is yet another example of the rot that’s prevailing. On a similar note it’s more productive to my way of thinking that Together NZ has gone from not being willing to work with any other political party to being open to working with those who meet ‘our’ criteria of removing all references to the Treaty and its’ principles from legislation as a starting point. Dudes, Tim sent this message below . . . it’s a ‘must see’ as I believe he has an important role to play as a change agent to halt NZ’s slide of destruction. . .
Carol, I’m not sure where your third to last para comes from. Working with other parties would only happen once they’re a political fact and you have no choice. Before then, you want their voters. NZ First, for example. When people suggest cooperating with Winston, I say, “Why is it that New Zealand’s most ethical generation keep placing their faith in New Zealand’s least ethical politician? If a single-issue party is going to succeed, it would certainly need to convince Peters’ supporters to recognise that he cannot be trusted to do what he says he’s going to do. He did nothing about this problem when he had the chance. Competing for party votes would be the first priority. Cooperation with others would come later. Sorry about my confusion of words John; words aren’t my forte as I’ve said before. What I was trying to say was that early on when we first learnt about Treatygate and your blog etc. we saw a replay of the Maori Channel interview above where you mentioned that you’d never work in with another party. Then fairly recently you said (in your blog) that if elected, you or Together NZ would work in with another party IF they agreed to meet certain criteria of what we are working for; namely to achieve one country for all people equally. The second statement was contrary to the first and is potentially more productive (I believe) than trying to ‘go it alone’ in parliament as intimated in that interview. YES our first priority is to get the high % of the party vote we can but as it’s fairly unlikely we’ll get the numbers to rule NZ alone, there needs to be a Plan B.
I was worried that we may lose support if voters thought Together NZ would try to bring about change within parliament by themselves independent of all other parties. Like, if the Maori Party weren’t aligned with National it’s doubtful they would have achieved any of their destructive political aims. We need to use all the weapons we can to achieve our ends and that may mean doing a ‘deal’ with another party in parliament depending on the election outcome…. which is what I thought you ruled out in that interview. that they are party to a bribe. NZ First introduced the current “Free health care” for under six year old children. Great legacy for our Grand children folks. NZ First introduced the “TOW Deletion Bill” into Parliament in 2006. The bill was defeated(sabotaged) by all the other parties including those of a right wing flavor. Making less than factual statements about NZ First will not endear Peters supporters to jump ship to a yet to materialise party. Lets set our prejudices aside and give credit where it is due.It is so easy to be negative, which is not helpful to anyone. John, NZ First is the most politically “INCORRECT” party in parliament currently. Given that what we are fighting against stems from Political Correctness and theories that entails, this would mean NZ First is a rather valuable ally of our cause. This allegiance is evident by the lage numbers of elderly that support Winston and his policies. To defeat PC we need to step back a generation, back to where success was based on equal opportunity not equal outcome. Equal outcome is marxist and is the root of the current problems the west is facing be it multi or bi-culturalism, radical feminism, homosexual rights etc, all these things take away from what western society has for centuries known as morally right. For example has NZ leadership ever not given maori equal opportunity? It is obvious they have unequal outcomes but as long as the leadership provides equal opportunity it provides equality. it is up to the individual and their culture and society to do the rest. As soon as government steps in to attempt to provide equal outcomes and all the sordid policy that entails, we enter the realm of marxism and revolution against the nuclear family, success based on individual achievement, and freedom of speech. I noted in a previous post that the Anglican church is now an apartheid church, known as the Anglican church of Aotearoa, New Zealand and Polynesia – with three separate bishops. Since when were Aotearoa and New Zealand two separate places? I find it incredible that the church that formed one of the pillars of Western civilisation should conspire to destroy it and undermine its own achievements. Also check out my post re the Catholic Church (of which I am a member) on the blog that JA mentions. Re my blog on this subject I recently received a reply (many months after writing) from a representative of the Bishop of Hamilton. They attempted to refute my concerns about the lies told about the battle of Rangiaowhia to a group of Catholic primary school children. They claimed they were offering the children ‘balance’. I am in the process of drafting a reply. Central to this issue is what relevance the idea of ‘balance’ has in relating the known facts of history? I would suggest only truth is relevant. In this case the truth was kept from the children and they were taught a ‘Maori perspective’ which centred around claims that are demonstrably false. This is the direction that all mainstream denominations have gone in since the 1970’s, lead by socialist activists. It will be a long way back to any genuine ‘balance’. As an ex-teacher – both primary and secondary ( I left at the end of 1996) I can say that this has been going on for a long time but is rapidly getting worse. An individual teacher can do very little from within the system. If you put your head very far above the parapet you get attacked very quickly and of course no matter how good you are as a teacher by objecting you automatically destroy your chances of any promotion. Probably the majority of teachers don’t agree with all of this racist nonsence but the unions are run by the activists who by their vary nature are active in creating this situation. Most teachers are ordinary people with familes to feed etc and often think that their skill set cannot be transferred to any other occupational field and so they just keep their head down and do the job as best they can. Please try to remember this and concentrate your attack on the activists who really ARE the problem. I wasted a good letter of complaint to the Human Racist Commission ( I assume the ‘R’ in ‘HRC’ stands for racist?!) so tried again with a complaint straight to the horses mouth…the UN. Told them about the racist privileges etc only available to the (part) maori who are NOT indigenous. I’m expecting the mother of all PC BS double speak drivel in reply. 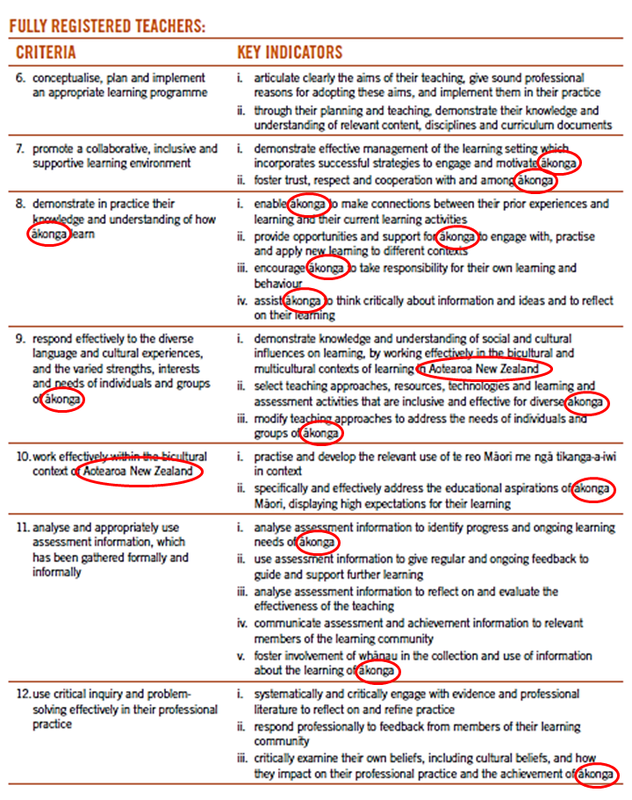 I’ll copy & paste here…if they bother to reply. .
Secondly just how does the teachers council expect teachers to promote equitable learning outcomes? At best a teacher can provide equal opportunity to learn but the learning outcome is very much dependent on the ability and work ethic of the individual students. That is of course unless different standards are applied to grades to provide some kind of equality of outcome. Is this what is being proposed? The socialist dogma which for the present at least works hand in glove with Treatyism, is one of ‘Equitable Learning Outcomes’. This unobtainable and in fact undesirable and impossible mantra has captured most if not all of the teaching fraternity. In a column in the last BOP local newspaper for example the new principal of Mt. 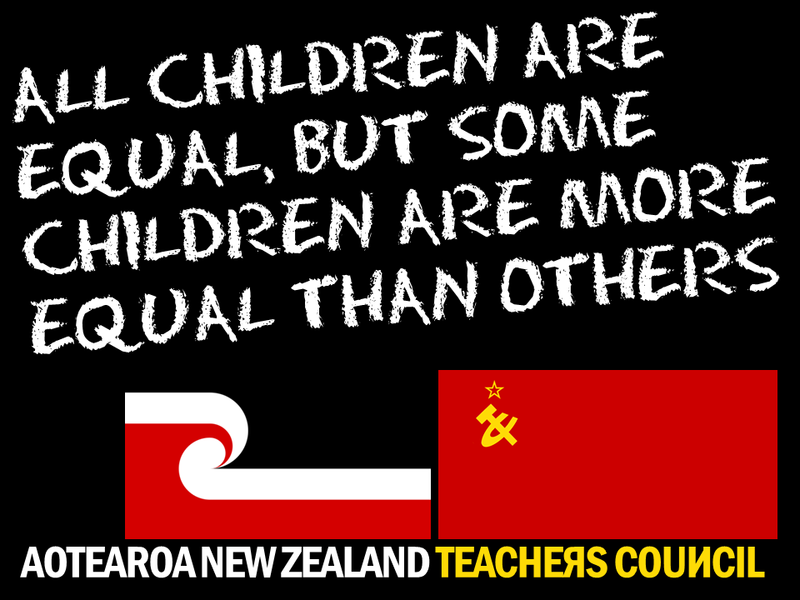 Maunganui College defines ‘fairness’ in education as ‘achieving equitable learning outcomes’. The philosophy behind this is that everyone must come out of the system with similar achievement, otherwise the system has failed. If Joe achieves twice as much as Mac, then Mac has been ‘disadvantaged by the system’ and ‘the system has failed him’. It matters not that Joe may be twice as bright and/or worked twice as hard as Mac. According to this philosophy the level of resources for Mac must be increased until the achievement level is similar. This is exactly what happens in the current national system where ‘low decile’ schools receive far more funding per student than ‘high decile’ schools. If can be seen that due to the fact that everyone is different, ‘Equitable Learning Outcomes’ will never be achieved no matter what the level of resources is. We have experienced the inequity of this directly with my disabled son, who has been the subject of a recent post by JA. For many years we had him at a low decile school with a high Maori roll. He received quite a lot of assistance there due to the school always having a surplus of funding. We then moved to a high decile school. Suddenly funding became a major issue and was cut altogether. This was no coincidence. Special Education dropped him asap because in a high decile school he was no longer of interest to them. Incidentally the only real difference between the schools was in the attitude of the parents. Teachers were similar, kids not significantly different but the attitude and conversations amongst the parents were very different. As you have stated the only ‘equitable’ situation is to provide for all to receive the same standard of educational opportunity, that is, the same level of funding per student, similar standard of teachers, similar standard of schools and equipment. What the different parents and children choose to do with this is up to them. So very true MIke, the roots of our/NZ’s problem and perhaps the maori problem are marxist roots and all the techniques that ideology entails be it deconstruction of history, the treaty etc, or critical theory, affirmative action, and of course political correctness. The marxist ideology which the NZ left such as greens, labour, maori and mana parties subscribe to believe in equal OUTCOMES, this is not possible just look at the USSR. Whereas the conservatives, objectivists etc believe in equal opportunity and no more, this is TRUE EQUALITY, everyone gets the same opportunity to succeed, whether they do or not is up to the individual, not the STATE. If we can defeat PC in this country we can defeat the treaty industry, but knowing the marxists they are all about revolution and wouldn’t happen without a fight. Also one has to wonder why National has formed a coalition with a blatantly marxist party i.e the maori party as this goes against everything the National party stands for! This suggests the ideology of the national party has shifted and in NZ right now there is no TRUE right political party. This is where the conservatives may have success as similar conservative parties are starting to have success in europe. It has become apparent the the marxist liberal ideology fostered since the 1960’s by the hippy/boomers the ones still holding the world’s purse strings – has failed. I think we may soon see a backlash against all things PC in hopefully the near future. If we can align ourselves with this anti-pC doctrine of the conservative we may capture a large chunk of the vote of disgruntled national supporters who are looking for a non-PC party which is essentially the NEW Right. I have mentioned previously on this blog, that what the above contributors are complaining about, is classic zionist conspiracy, but callled by its modern monicker of ‘multiculturalism’. The first country to be destroyed was the Russian Empire, but remarkably, after 75 years it was able to pull itself back from the abyss and restore its old culture, its flag and its anthem. What is happening in New Zealand is not accidental. It is planned and is occurring in many other countries. Together New Zealand must be the first and only organisation, so far, to call enough! Congratulations to John Ansell and all the rapidly growing numbers of people who are rallying to the cause. What we are all doing, individually and in unison, will succeed, but it won’t be easy or quick, but it has to be done. It’s roots here are more Marxist than Zionist Conspiracy Peter. Google the Frankfurt School or Antonio Gramsci or Geog Lukacs or Herbert Marcuse – Ero and civilization or Theodor Adorno – the authoritiarian personality all these individuals have contributed to the political ideology which is at the roots of today’s green, labour, manan, and maori parties, and the roots of the radical third wave feminism which also advocates equal outcomes over equal opportunity, and minority affirmative action etc all stem from the marxist ideology and it’s techniques developed be the Frankfurt School. Grouped together these techniques are what constitutes Political Correctness. We need to move back a generation, back to the greatest generation that fought the war, these idividuals had the right ideology but made the mistake of assuming the threat was over, however they did not count on “the march through the institutions” which began as the hippy generation carried their ideologies into education and higher education, where they remain these days in the upper faculty. The problem with the left in this country is that being marxists they have to follow Critical Theory. This means that no matter what happens while National (the authoritarian personality) is in power, no matter what the government or any ministers say, the greens especially and labour must be critical. This is to attempt to create a perception of uncertainty among the populace. I have just been reading quite a bit about cultural marxism and it’s spin-offs political correctness and radical feminism. Not to mention the hippies, whose slogan “make love, not war” was created by one of the main marxist thinkers of the time. The poor boomers were conned big time by marxism and we are all suffering now because if it. Also the extremely marxist maori sovereignty movement was largely aided by the end of the cold war, when nZ’ers though the threat of communism was over, and when the USSR broke up in the 1990’s we were all unaware that the maori sovereignty movement had silently marched through our own institutions. In fact most of us don’t realise it now. The fact that labour and especially the greens, mana and maori, hide their marxist roots makes me sick as by doing so they continue to con the average voter. Having let out an enormous sigh of despair after reading your blog, John, all I can say is thank goodness my children have grown up, otherwise I would have had to take them out of the education system and home schooled them. I have to say I agree with Peter. This is all planned and has been creeping in gradually for years. I really fear for our future if the people don’t quickly wake up and protest very loudly enough to make our politicians pull their horns in and start listening to the people. I can still see it. One day the people are going to wake up and ask ‘how did this happen?’. Well, it is their own fault as we’ve been trying to tell them. Some listen, many don’t or won’t. 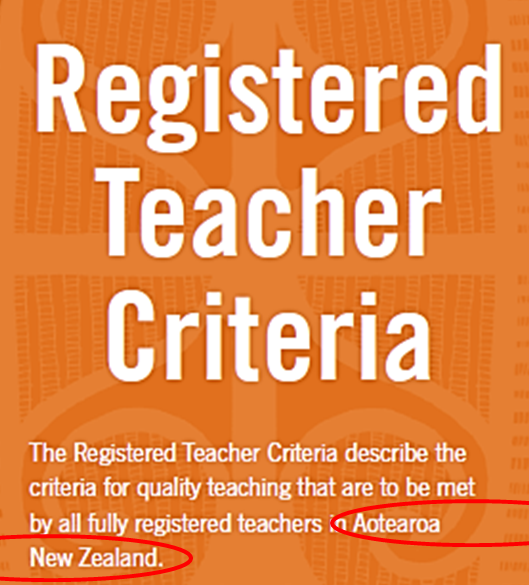 I’m shocked and astounded at the new name for learners and there we go again – ‘Aotearoa’ creeping in with New Zealand. We must oppose it very clearly at every turn. More coincidence good people? you must decide for yourself of course. Is the system really broken or just destroyed slowly over time and manipulated by the greedy elite for their own base Human behaviours / desires / Ego over the masses solely from a myopic self serving minorities viewpoint? hmmm the plot thickens more and more when properly investigated. Personally I find with all the evidence that abounds to the general public ( that can be bothered researching facts for themselves ) nowadays as more and more finally awaken and speak “Truth”. Surely if it aint broken don’t fix it but if already broken then smash it to bits and totally rebuild it from the ground up is the norm isn’t it? After my posting of it I went to youtube and viewed it again it was not taken down as suggested when clicking the link. If you are interested in viewing open youtube and type in George Carlin Illuminati New World Order Exposed. This guy may well have a lot of truth in his warning message …. HOWEVER, why the hell do the audience squeal, clap and applaud as if they are merely entertained by his words ? They are clearly idiots, and their behaviour grossly undermines the message, to the point that you are left wondering to what extent it is worth heeding. I have very little time for such clowns. How does the New Zealand public view their personal response to anyone other than mainstream elite trying to enlighten the masses in any way possible to them when MSM wont touch the story with a bargepole. Do you roll with the punches to get the message out there in any medium you can at the time perhaps much like J.A. to the best of your ability with what you have available at the time perhaps. As someone once stated on this blog the Truth comes in three stages along the lines of scorn and derision at first then outright denial followed by the self evident realisation of undeniable fact that it is indeed truth or words to that effect. Thanks for a very relevant viewpoint johnp145 and have a great day. Doesn’t saying Aotearoa and New Zealand like saying New Zealand New Zealand? Why does it need to be said twice, is that because people who aren’t NZ’ers would have no idea what/where Aotearoa is. Because of political correctness insanity! I think it’s more accurate to say it means North Island New Zealand, which is a little unfair to the Mainlanders. New Zealand has a name, a legally binding name and it ain’t Aotearoa. It is my understanding that Aotearoa was the original Maori name (or one of them) for the North island only. Therefore what is really being said is ‘North Island, New Zealand’. Pre-European Maori had no understanding of themsleves as a nation or of any other peoples and I seriously doubt that they could have comprehended the country as two main islands. It simply was what it was. It is one of the ultimate stupidities of multi-culturalism that considers all civiliizations, all cultures, to be equal. Maori society was simply much less advanced than European society was when Europeans came here. This is a similar comparision to European society as compared with Chinese society in say the 8 century. Much of what we are seeing now is an attempt to somehow not just rewrite history but also to validate Maori as much more advanced when Europeans came than was in fact the case. Also much of what happens today is based on power. The attempt to alter the way place names etc are pronounced is a way of demonstrating that they have the power over everyone else to be able to change such things. The renaming of the North and South Islands is just such another demonstration. You are right Roger – it is all about power, and of course with power comes wealth and privilege. But they can only grab that power if we as a nation allow it, or hand it to them. Sadly, we have been doing that for many years – to the point that it will be difficult to take it back and get back to true equality. It will be extremely difficult – I hesitate to say impossible but possibly so and if it does happen it looks as though it will be long after I am dead and gone. The biggest impediment are the white middle class who hate to offend and so will go to great lengths to simply stay away from the topic. I raise the topic and watch as people squirm and look uncomfortable – they don’t want to talk about it and indeed will often glance around as if afraid in some way that they will be overheard. I also find complete ignorance – e.g over the seabed and foreshore – subjects can be debated at length in the media etc and some people are just unaware. They might know about the next rugby game in detail but nothing about anything important at all. The media certainly encourages this – the Gilmore thing is a perfect example. They have made a huge thing about a drunk and uncouth MP – so what’s new! What have you read in the news about the constitutional review? It depends what you mean by “read properly”, tuki. Does a person have the right to speak in his own accent? Or must he adopt another’s accent in order not to be condemned as “racist”? I agree that people should always pronounce words correctly within the bounds of their natural accent. To do otherwise would be disrespectful. But we should not have to imitate a Maori accent any more than we put on a Chinese accent to pronounce “Bei-jing” or a Spanish accent to pronounce “Barthelona”. A few years ago, I was reproached by Te Karere interviewer, Tini Molyneux, for not pronouncing the word “taonga” as she preferred. 1) I had pronounced the word as correctly and respectfully as I could, without adopting an unnatural Maori speech pattern. 2) She herself was quite happy to mispronounce her own French surname as “Molynoo” instead of the correct “Molynurr”, and made no attempt to pretend to be French. Before Griever Maori complain about the Maori pronunciation of non-Maori, they should attend to their typically appalling and often abusive writing of English. Not wishing to defend or support Winston John,I have a large printout from Hansard where he continually question Helen Clark on the so called principles and could never get an explanation. At the time I was an elected rep and bought up and questioned the ‘principles’ at a meeting. People just looked at me .No clue. I felt a bit rotten about leaving this fine thread on such a stink note with my comment of the NZTC and thought one may appreciate a better outcome for all with a musical interlude to appease any downhearted souls in the audience tonight. TP: Are you sure you’re not confusing racism with criticism. Which comments do you say are racist? I also take a dim view of people who call people racist when they’re not. PS Don’t bother replying. IM doing some research on EDUCANZ and the TEACHERS COUNCIL and this site popped up. I’m going to have nightmares. So many ugly thoughts and no need. We as Maori just want to be Maori. I still acknowledge my Pakeha lineage in my teaching methods as well as Maori, it’s who I am. Though I can understand some of the concerns, there is just so much hate. I feel for you all. You’re welcome to “be Maori” if you want to, tuki – even though by your lineage you could just as easily choose to “be Pakeha”. For Maori, all of whom are now of mixed race, racial preference is clearly a choice, like being Catholic or being Anglican. But those who are not part-Maori should not have to “be Maori”. They have a perfectly good culture, and a language that the whole world wants to learn. Why should they change it to make it less understandable? Many “Maori” prefer to be New Zealanders. I’m with them. Tuki, You must get your facts correct before you start slinging names at people, Maori are not a race, they are of the Polynesian race that arrived in New Zealand on whaka they still know the names of, which makes them immigrants the same as the rest of the population. It would be not good for the people if the customs prior to European settlement were revisited, New Zealand was one of the last countries in the world to abolish slavery for a starter, do you have any idea how many people were classed as slaves prior to the treaty of Waitangi? I like the word ‘akonga’, am a teacher and totally okay with it. As I would expect from a New Zealand teacher, presumably one thoroughly brainwashed by the radical Maori sovereignty agenda. That does not make it OK to entrench a word understood by 100% of the population from a language which the whole world wants to speak, with one from a language spoken by a fraction of 15%, most of whose words have been made up in recent years. Gosh, I wonder what has brainwashed your small mind. What an ugly little blog, full of racist comments and slurs. I am glad the world is not conforming to your narrow vision. I wonder where most of the people come from who contribute here. I would guess the bottom of Africa by the sounds of some of them. I love the shift to using ‘akonga’. There needed to have been a treaty. And yes it may have created an industry……….but then so had colonisation. I love the use of maori words in documents. I know what they mean and the concepts that are different to european culture. Only a fool would not learn from someone else. And the really blind people are those that think they see everything. Love Helen Kellers reply when asked what it was like being blind and not being able to see. She replied, what is it like to have eyes and no vision! And that Mr Ansell is possible why the replies here irk my soul and disappoint me so much. Its like you are looking thru a filter. Ka kite! I too am a poet, by I am not blind. I am not aware that anyone who comments here conform to your perceived stereotype, but are concerned New Zealanders not willing to surrender their sovereignty to the fractional descendants of those who breached the Treaty and rebelled against the Crown in the 1860s. My beef is no more with ordinary Maori than Churchill’s was with ordinary Germans. It is with the corporate con artists who claim to be their leaders and squander their gains – many of which have been gained dishonestly by the intervention of a kangaroo court which accepts shoddy evidence, and an appeaser government which indulges the claimants at every turn. But the Treaty claims are not my main concern. The main problem is the creeping apartheid that is as unacceptable in New Zealand as it was in a more extreme form in South Africa. Let me ask you a question: do you believe in majority rule in South Africa? Theblindpoet is one of those brainwashed liberals that thinks telling the straight honest truth is somehow ‘racist’ if it is not what he/she wants to hear. Here’s a fact; All non-maori kiwis are second-class-citizens because we have not one legal privilege based on our skin colour/blood lines. If Blindpoet can name just one legal privilege we get that is not available to maori ( who get hundreds) due to race/blood, he will win the argument. If he can’t then I win. Fair enough?! I am heading back to work today and the ships internet is dreadful, however I will check in when I can to see that I have won. It’s amazing how often the ‘r’ word comes up when they don’t have a proper argument against their racist policies. Special treatment based on race is apartheid/separatism and we are certainly more or less there in this country. If the blindpoet wants to assist this then he’s the one who is a racist because he believes in things based on race. I firmly believe we should all be treated equally with no special treatment based on race, so how can that be racist? There are many languages we can learn which would be helpful elsewhere. The Maori language is of no use anywhere but this country so this is why it’s a waste of time foisting it upon those who do not want to learn it. I would rather learn Gaelic if I was forced to learn a language but that has the same problem as Maori in that it is of no use outside Scotland and perhaps Ireland, so I wouldn’t bother with it..
That person has certainly picked a very apt name for itself, BlindPoet most assuredly describes not most but all His/Her posts. On 02 July I challenged ‘theblindpoet’ to name one, just one, legal privilege we non-maori get that is not available to maori ( who get hundreds BTW) due to race/blood. If he/she could do that then I admitted he/she would win the argument. I arrived back in NZ yesterday and went through all the comments. That was the last we heard from theblindpoet. Equality is all about equal opportunities, NOT equalising results. I taught both primary and secondary school for almost 40 years and I am certainly NOT happy with using this word or with the obvious racial brainwashing that is going on at all level of our education system. Believe me there are a huge number of teachers who are also most unhappy but most have been sufficiently cowered that they remain silent of necessity. I know, Roger, and for this reason we who don’t have to worry about our employment chances in this field should speak out on their behalf as well as our own. It’s an utter disgrace the brainwashing that is going on and also bullying for those who dare question it. I do as often as I can but am often side-lined and speaking with others my age (mid 70’s) I tend to get a glazed expression and they want to change the subject. Most when pressed agree it’s ghastly but then ask ‘but what can you do’? Terrible situation we have got ourselves in! Worse still for those who have been out of the country for a number of years and come back and can’t believe what has happened. Personally, I don’t think anyone who thinks like this (anti) about the word ‘akonga’, should be anywhere near a classroom with kids. Those racial and narrow attitudes will most certainly be picked up by the students. I have been teaching 30 years plus and am glad I am not feeling even slightly like some of the people who have responded. I fear this is a site full of racist and resentful people who have no wonder and love of language unless its english. The empire has fallen people, and it wasn’t all good. I got it from you as you know perfectly well that people who control the meaning of words also control the debate. People like you wish to force others to think as you think. At the moment we are in a battle to protect our democracy from those who would subvert it by having unelected people with voting rights on councils. Certainly minorities should have representation but only within a democratic state. Your ‘white man’s language’ has got nothing to do with it. In a democracy the majority rules not the minority. I found a few people like you in teaching- thank goodness just a very few although now they seem to have more power than ever before. They hide behind the label liberal while debasing the concept as they are the least tolerant of all. I also am fine with children learning words from other languages. 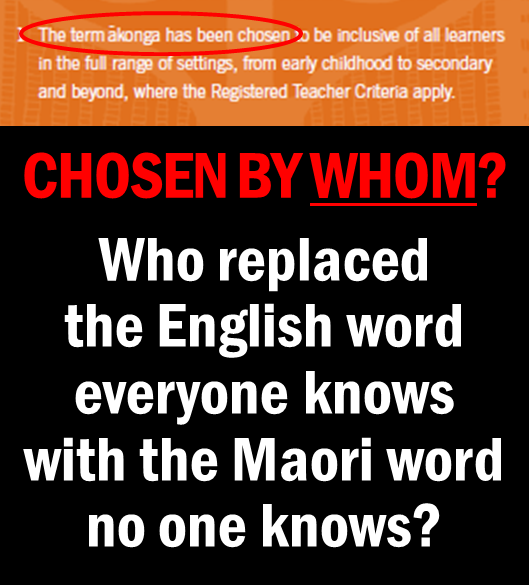 But of course our Maorification agenda demands that only one other language be taught, along with exaggerated accounts of evil Pakeha doing dastardly things to innocent Maori victims. No mention of the brutal butchery committed by the latter. Why should we be required to commit cultural suicide to appease the violent descendants of the rebels of the 1860s – who were warned that if they breached the Treaty and took up arms against the Queen they would be punished with land confiscation? Why, just because our politicians are too cowardly to stand up to the socialists who want to shred the founding fabric of our country and rebuild it as New New Guinea – too cowardly to put up with being wrongly branded racist? And of all the virulent breeds of dishonest Kiwi niceists – politicians, bureaucrats, journalists, teachers – the dishonesty runs deepest in the people to whom we entrust the education of our young. They are propaganda parrots, they are flagrant liars, and they are traitors to their nation. Gosh, in this comment I realise that this is one of those ugly right wing blogs that I am a reasonably central kinda guy want nothing to do with. Pray tell Mr Ansell what is the opposite of Maorification? And really I am not even interested in your answer. This is not a debate space, but rather a space for venting right wing narrow minded keep the world nice for me kinda place. No one says anything logical or listens to anyone, just like in America where this kind of democracy was spawned. The opposite of Maorification is fairness – no state racism whatsover, no privileges for anyone based on their body chemistry. If you find that ugly, you are a racist. My body chemistry is mostly of British origin, but in the interests of the same fairness I am also campaigning to remove the Union Jack from our flag. As it happens I want to replace it with the silver fern – a plant of Maori origin – on a traditional Maori colour – black. I want this because regardless of the design’s origins, this emblem and colour now represent us all. That’s what I want the government to do: represent us all, equally, as New Zealanders. Do you realise that in no fewer than 14 separate polls, many of them binding local body referenda, a consistent 80% of voters and respondents opposed racial favouritism? The recent overwhelming rejection of Maori seats by the citizens of New Plymouth followed similar results in the Far North, Hauraki, Waikato, Rotorua, Nelson, Wanganui, Wairoa… every single town or region where the citizens have been allowed a say. You might like to think about that next time you brand the people here as some sort of fringe element. sorry about the typos…rushing as usual between thoughts and classes. correction… You come across as wanting to create a problem because of your gripe with minorities having some kind of acknowledgement and that white mans language is No. 1. Well, I think it is ridiculous. I don’t have a problem with people using Maori words in private and amongst people who want to use them, but to force change on everyone from a word everyone knows to one very few know, is crazy. I can just imagine non-New Zealanders looking askance upon hearing ‘atonga’ and probably many New Zealanders also. I’m not the slightest bit interested in learning the Maori language and I’m sure there are many who feel the same. Also, the more it is foisted upon me the more I will rebel against it. English is the Universal language understood by many and it’s so much easier to use it so as to be understood by the majority. People of Maori descent all speak English so there is no problem for them, but learning to speak Maori is their perogative if they wish to do so. The Blind poet comes across as one of those people who believe that what they believe is what everyone should believe. We have been there before as a civilization and its not a good place. ohh you are so very wrong there……….that’s the pot calling the kettle black me thinks….how you got that from what I say I don’t know…..truly. There’s none so blind as those that don’t want to see (the truth). Blindpoet, there is no hate here, just a desire to be treated equally. Do you think maori are more special than anyone else? I strongly object to my second-class-citizen status, which is imposed upon me because I am not part maori. It is undemocratic, racist and abhorrent to be denied privileges because of my skin colour. Shame on you for being a racist. Oh well said!! I refuse to vote for or support in any way, any political party that says that I am a second-class citizen. Our education system is trying to make some children into second calls citizen-time to resist. Just read right through. The boss of the Teachers Council is Hekia Parata. It is her construct. Direct any and all complaints to her. Say no more, poled. That explains this nonsense. I will certainly be writing to her. I enjoyed reading this article, also a similar one about indoctrination in teacher training. I know people who feel so disillusioned with this obsession in ECE. I know of an amazing teacher who has put her blood, sweat and tears over the last almost 20 years into her role as an Early Childhood teacher, she has formed incredible relationships with the children, parents and community, has excellent curriculum and assessment knowledge and is an incredible teacher. 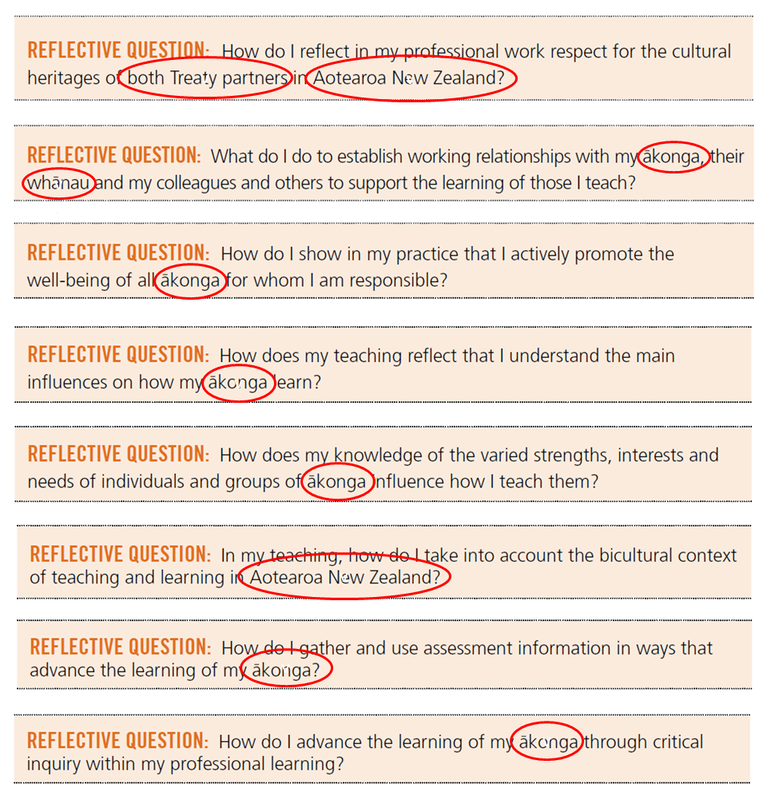 At a recent appraisal this teacher discovered that none of this mattered because she wasn’t able to list the Principles of the Treaty of Waitangi off the top of her head. The appraiser, a senior leader with a professional association (not actually a registered teacher and with no classroom experience themselves, just a heap of degrees) expressed disbelief that she had managed to become a registered teacher and not be able to recite this, apparently when this person interviews teachers for ECE jobs, if they can’t say their mihi they are not considered for a job (not matter how fantastic a teacher they may be in all other aspects). Also, the interviewee is asked a question in Maori. If they don’t know what is being asked, no job. If they reply in English they are placed in the “Maybe” pile and if they can answer back in Maori then they are placed high up on the list of potentially successful candidates. Who cares if they are the most outstanding teacher in all other respects, this is what is apparently the most important thing when selecting a teacher. My friend has had enough of this nonsense and has decide to leave teaching after giving so much over the last two decades. So very, very sad. That is gut-wrenching, Becks. The best teacher I know is teaching English in Japan for the same reason. It is so disgraceful what is going on in the Education system and elsewhere for that matter. We are going to end up with very inferior teachers because of this utter nonsense. I would never be accepted because I would rebel on all this Treaty rubbish at every turn. What on earth does it have to do with good teaching? Words fail me! !